The demand was made in connection to international right to know day, commemorated each year on September 28. The right to access information held by public bodies, known as the right to information (RTI), is an internationally recognised human right and protected under Article 19-A of the Constitution of Pakistan. This constitutional right provides a range of benefits to the citizens of the country, including promoting democratic participation, combating corruption and helping to foster effective, accountable and a responsive government. Although over a decade has passed since the first Freedom of Information Ordinance 2002 was enacted at the federal level, it took another 11 years to enact an internationally accepted law in the form of KP Right to Information Act 2013. The introduction of this new legislation could have guaranteed right to information for the general public had the provincial institutions not rallied against the law. The KP assembly once tried to exempt itself from the purview of the law, but the decision was later taken back. According to details, so far, a clear procedure has not been laid-down for recovery of fines from the violators of the mentioned law. The law does not elaborate on whether the decision of the information commission could be challenged through writ petition in the Peshawar High Court (PHC) or in district courts. The law in its current form does not bind the government to appoint new information commissioner, within a specified time frame, when the incumbent information commissioners complete their tenure. In order to improve the law, the KP RTI commission proposed a number of amendments to the KP RTI law, which had been collecting dust in KP law department for years now. These amendments recommended making the PHC as an appeals court against the decisions of the KP information commission, mandatory appointments of information commissioners once the incumbents retire or resign, and empowering information commission to ensure proactive disclosure by public bodies. However, these amendments have not been approved yet. Earlier, the KP government had enacted the law to show its commitment to transparency. 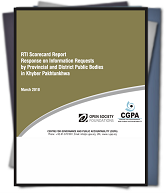 But the provincial government failed to notify the rules, extend the law to Provincially Administered Tribal Areas (PATA), and not approving KP RTI commission’s proposed amendments which points towards serious gaps in the KP government’s commitment to exercising transparency and accountability.